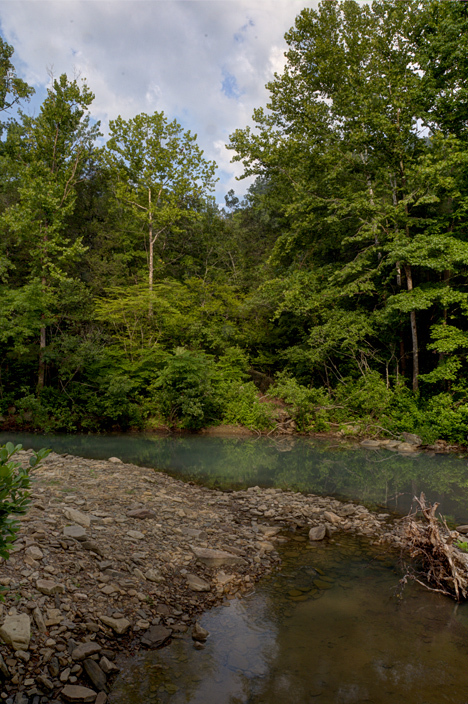 This pool is just downstream from a low-water bridge over Falling Water Creek, north of Ben Hur, Arkansas. The location sneaks up on you. This nice little pool, just upstream from a low-water bridge on Falling Water Creek, north of Ben Hur, Arkansas appears in your windshield nearly all of a sudden. As you round a downhill curve on the rocky road approaching the bridge, there it is — one of the reasons you come to the boondocks. Since traffic is mostly non-existent, I always stop smack-dab in the middle of the bridge — that is — if the water is not up. In that case, once it reaches a critical height, attempts to cross may be hazardous to your truck, and your person. Click the pic to see the falls and read the story. Since most of you will never see this delightful site, I considered it to be an obligation and public service to show it to you. This location is smack-dab in the midst of several great waterfalls, most of which are easy to find, approach, and ogle. The one falls in the neighborhood which requires a little effort to see is “Fuzzybutt Falls,” a mile or so downstream from the low-water bridge. Fortunately, I have caused a story and two pictures of said falls to be included on the Photo of the Week Page at Corndancer dot-com. Go there and see the falls in two permutations. By the way, my name for the falls is “Hidden Hollow.” The rest of the know world disagrees with me. 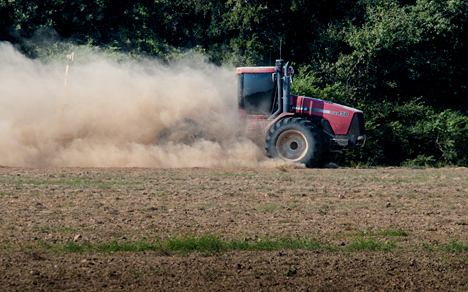 It was a dusty Delta Day, Billy Joe. The pictures you’ve seen in this post are from the same state, Arkansas. We gotcha mountains, we gotcha Delta, we gotcha Piney Woods, we gotcha Grand Prairie, we gotcha … oh well you get the drift. The old Arkansas Power and Light Company generating plant in my home town is not for long. The yellow Caterpillar will win. These are the last shots of this structure. 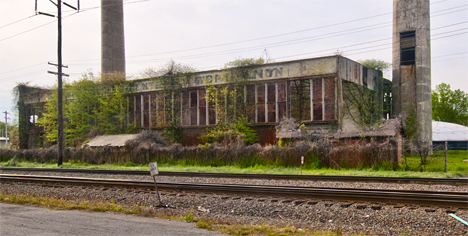 The old building was hatched-up, built, equipped, occupied and put into use for a very specific purpose: to generate electricity for the good folks in Pine Bluff, Arkansas in the first quarter of the 20th century. Evidence supports the theory that it did just that and did it well for a long time, but at some time, it stopped. 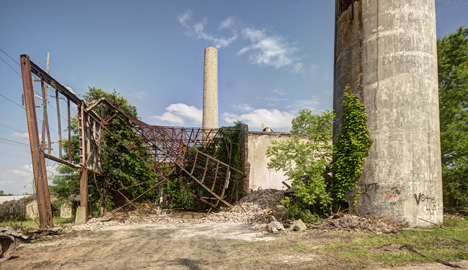 Click the pic to see more of the old power plant. I’m not certain when the last person left the building and turned off the lights, but I do know why. 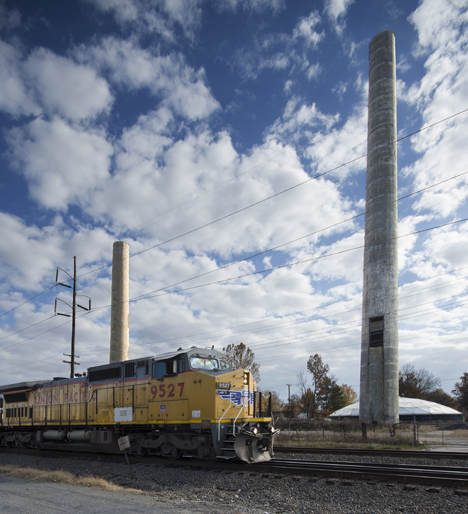 Someone found a better and more efficient way to send electricity to the folks in Pine Bluff — and it was lights out for the old plant operationally. Now it is lights out for good. And after all, if your lights come on and your fan blows, knowing the source of the juice that does the trick really does not pique one’s curiosity. Speaking of curiosity, you can learn more about the how and why of this shoot and see three more pictures on the Photo of the Week Page at Corndancer dot-com. We’ll wait here while you look. During the shoot, a train came through and who among us does not like to take pictures of trains. Certainly not me. 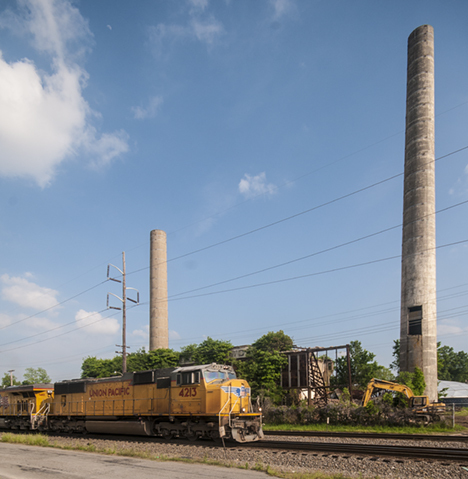 I had procrastinated on getting these images for decades, after all, where are two giant smoke stacks and an old power plant going to go? 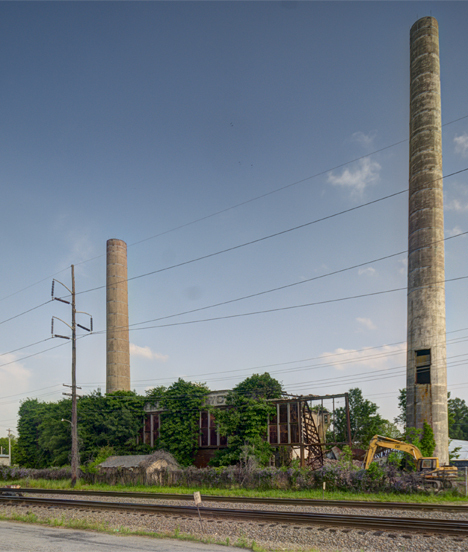 As I pointed out on our Corndancer story this week, some mysterious urge sent me to the old power plant in April where I got the first shots in morning light. When I came back for my afternoon shots just over a month later, the Caterpillar had started its grisly task. 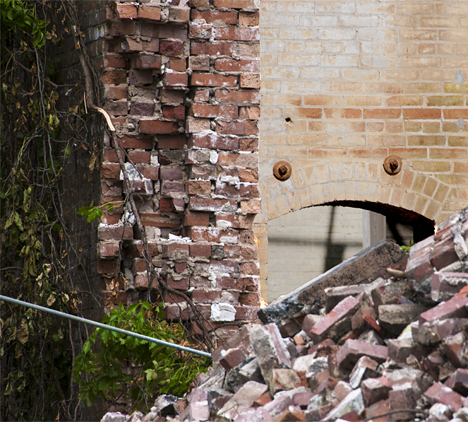 The building has been completely demolished now for several months. I set up the camera in approximately (best-guess) the same spot, waited a bit for a train and grabbed the shot below to let you see how it looks now. Here’s how the site looks today. The landowner spared the stacks indefinitely. They stand as a reminder of how things used to be. We are grateful they are still standing. The round-topped thingamajig in the background is part and parcel of a plant operated by Liberty Utilities, the nice folks who provide clean water for our city. I shot this in the crappy light available on April 13. As you can see, the building is unscathed. But not for long. The west end of the building was formerly here. Now twisted structural members are all that is left. The old structure is full of the old architectural details (temporarily), admired by many, including yours truly. 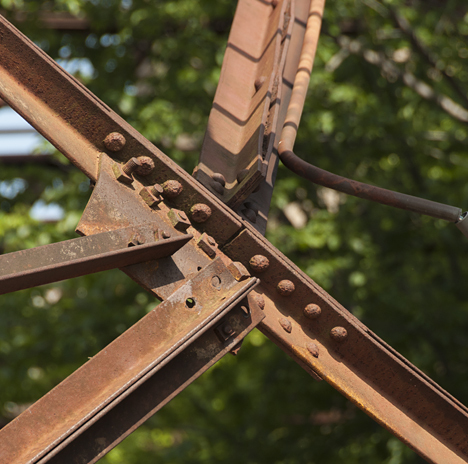 From the looks of things, in the custom of the time, the structural steel elements were riveted together. Now that the walls have come tumblin’ down, we see evidence of some field expedient engineering when something was added later. Look at the old square nuts. And last but certainly not least, for those of you who have always wondered what it looks like inside a big ol’ smoke stack, through the magic of digital presentation, we are making the revelation here and know. You saw it here first! 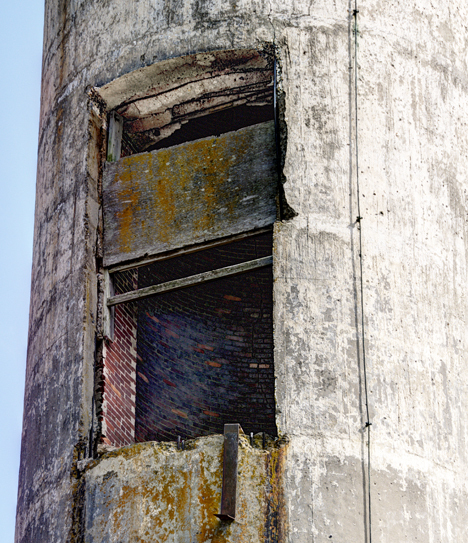 Looking inside the west smoke stack. It appears to be three end-to-end bricks thick encapsulated in a thick application of concrete. In “Southern engineering” rminology, that sucka’ is some kinda’ stout. Not questioning providential prodding, I am grateful to the Higher Power that sent me to the old building before it was too late. To tell the truth, there was some previous prodding, but in my human frailness, I resisted. Have I learned my lesson? We’ll see. 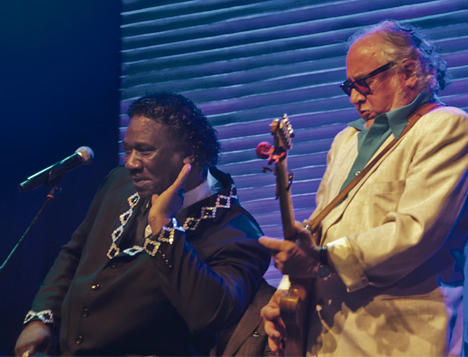 Mud Morganfield, son of blues icon Muddy Waters, shares center stage at the Blues Music Awards with legendary blues guitarist Bob Margolin who played in the band led by Mud’s famous father. Click on the pic to see Devon Allman, son of Greg Allman, playing at the Blues Music Awards. Unlike most performing arts, the Blues is not rife with prima donna performers. There is little if any ring kissing — and talking to most of the luminaries of the genre is about like talking to someone you meet in a checkout line. Perhaps the prevailing attitude is a lingering imprint of the Blues’ humble beginnings. Blues crisscrosses ethnic and age lines like a steel sphere in a pinball machine on steroids. Other than the music, in my humble opinion, that set of conditions sets the Blues apart from other performing venues. Nowhere is this set of conditions more pronounced than at the Blues Music Awards held annually in Memphis, Tennessee. The event is a giant southern sit-down supper that lasts for seven hours or so during which you hear blues performed by those considered to be at the top of the form — and see a number of them receive awards which confirms their greatness. Before we go much further, we suggest that you digress to the Photo of the Week page at Corndancer dot-com where this story started. You’ll see pictures of some folks named “Allman” and “Neville.” We’ll wait here while you look. Double award winner Janiva Magness turns in a lively performance of her award-winning song, “I won’t cry.” As she accepted her awards, her emphasis was on her family. 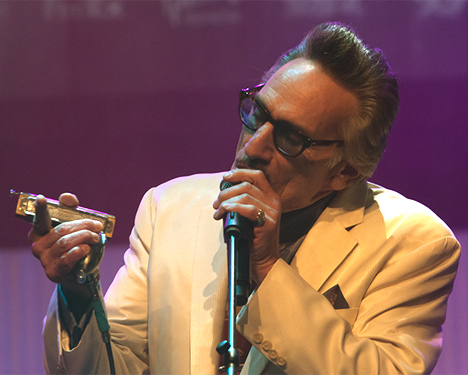 Rick Estrin, winner of the “Instrumentalist of the year, harmonica award,” seems to be in a Shakespearean mode, as in: “Alas, poor harmonica, I knew ye well.” Actually he is singing. His vocal talents are on par with his “harp” skills. 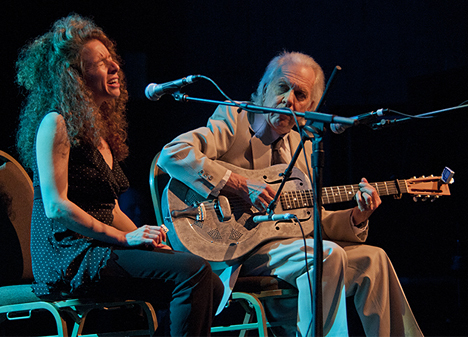 Annie Raines (vocals and harp), and Paul Rishell perform on the “acoustic” corner of the stage. The duo’s past awards include the W. C. Handy Award and the Acoustic Album of the Year in 2004. 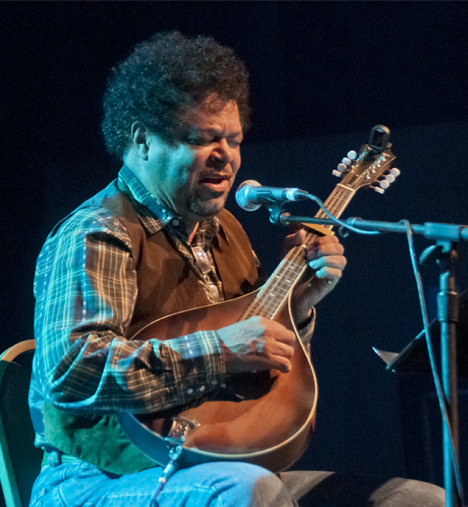 As Harrison Kennedy picked his mandolin and sang the blues, I imagined myself sitting on the steps of a country store on a gravel road, breaking a sweat, and slapping skeeters. That’s southern. The place of my birth, Fort Smith, Arkansas, is rife with legendary facts, rumors, innuendos, and suspicions. It sits on the Arkansas-Oklahoma borders. The Arkansas River separates the two states at the west end of Garrison Avenue. Similar thoroughfares in most other communities are called Main Street. The trip starts in the Moffett “business district,” at the Moffett City Hall. The hall is not unlike thousands of other small town seats of government. The business district is about three blocks long. Or so. Just across the river is tiny Moffett, Oklahoma. Claims to fame are limited there. It has a very popular stockyard and enjoyed infamy as an “entertainment center” for troops stationed at Camp Chaffee during World War II and the Korean War. So many soldiers were maimed and killed in the town that the entire municipality of Moffett was placed off-limits to military personnel. (Camp Chaffee was later changed to Fort Chaffee and was later de-commissioned as a U.S. Army installation). While I was in Fort Smith, I recalled a time when my father ordered baby chicks which were delivered to the Frisco Railroad Depot in Fort Smith. I wrote a story which touched on that. See it on the Photo of the Week page at Corndancer dot-com. You will also find a picture there of the Union Pacific restored engine 3985 under full head of steam. 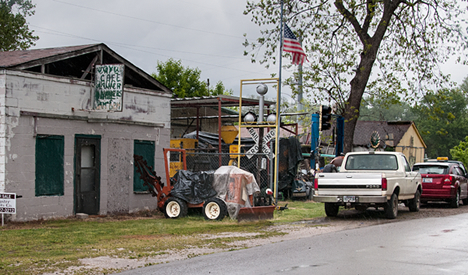 Next door to the Moffett city hall is the small town version of a large-scale variety store. Some of the merchandise would probably require a winch-truck for delivery. It was a rainy Saturday afternoon and the proprietor was on the scene ready for business. No tellin’ what’s in the inventory. 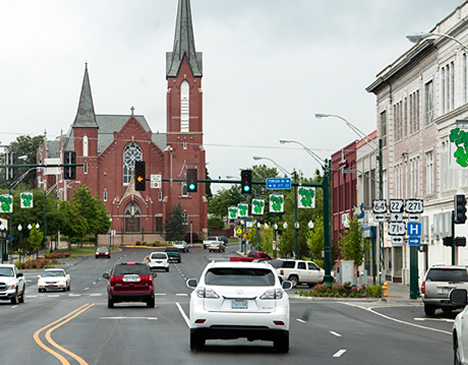 When you leave Moffett and pull on to US 64, you will eventually top the Arkansas River bridge and look straight down Garrison Avenue, one of the widest “Main” streets you will see anywhere. It is second only to Canal Street in New Orleans by a few feet as the widest “Main Street” in the Nation. Asphalt covers the original bricks which covered the original dirt. Immacuiate Conception Catholic Church stands guard over Garrison Avenue as it has since the late 1800s. The highway signs to the right mark Texas Corner. The hospital sign points to the institution where I first drew breath. Probably more factual is Texas Corner’s connection to “Texas Road,” which started in Fort Smith and led through Indian Territory (now known as Oklahoma), eventually to Texas. My friend John Paul Buie’s father operated a barber shop at Texas Corner and John Paul tells me the “Texas Road” connection is what his dad told him, so I am accepting that version. I am relegating the sign version to the rumors and innuendos categories, perpetuated for entertainment purpose. The video below supports the “Texas Road” theory. I have posted larger versions these pictures in a gallery along with this story. If you care so see ’em, click here: From Moffett to Texas Corner gallery.